Dance Floor Rentals that Look Brand New! Spectacular portable dance floors in every style imaginable. Our dance floor rentals come available in various sizes and infinite styles. Call or scroll for more info. 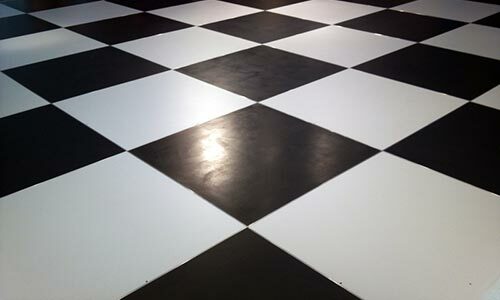 Portable black and white dance floor rentals are available in an endless variety of patterns. With professional set up and break down, the DFK team will help create the exact portable dance floor rental for the client. Suppliers of white dance floor rentals, in New York, Long Island, and beyond. DFK dance floors always look brand new and clean. The most versatile dance floor for decals, lighting, gobos and customization. Do you need a black dance floor rental? We have popular sizes and finishes for your event production. Black dance floors bring a unique look when creating an event. Accented by lighting, black dance floors are truly unique. Imagine a dance floor in any color. DFK supplies the event production industry with custom color dance floors to match any party design. Our exclusive technique will transform your event into a customized dream. Mix and match for stylish patterns, color palette, and many other choices. An LED dance floor is certainly the focus of any room, lighting up the atmosphere in your event. Guests always approve of an LED dance floor. Available in a variety of patterns and colors, the holographic dance floor adds pizazz to events. Prom, bat/bar mitzvahs, sweet sixteens, and quinceañeras are always more fun, and unforgettable with a holographic dance floor. Create the dance floor rental of your vision with DFK’s design team. These wrap dance floors can brand the client’s corporate event or turn the party into a unique visual event production. Straight out of a futuristic movie, or a mixture of old and chic, our Mirrored Dance Floors are gorgeous. There’s just no other way to say how utterly unique and quite handsome these floors can be. When the party moves outside, you don’t have to give up the dancing. Our Outdoor Dance Floors will turn up the party to another level. We can build a set on any terrain and ensure the edges are easy on and easy off. Dancing under the stars couldn’t be better! There’s nothing like a Wooden Dance Floor that says “Classic” and “Traditional.” The feel under your feet, the slide of a soft shoe, echoes the words style and elegance. Our wood panels come in 4′ x 4′ tiles to create a variety of sizes. Go ahead and break tradition with a Round Dance Floor. Having a round dance floor at your event adds a distinct look as a focal point. 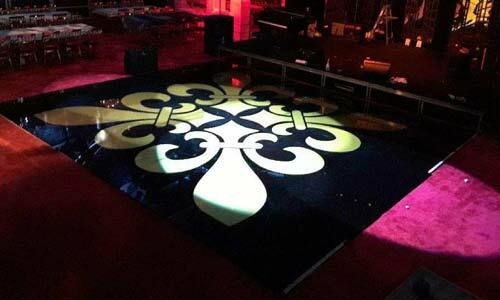 The professionals at Dance Floor King can create many styles and sizes of geometrical dance floors. For the latest in dance floor trends, Acrylic Dance Floors are versatile, and fit any event. With endless colors, endless choices of decals, or gobo lighting, and various finishes, we have your events covered. If you think we didn’t cover enough Dance Floor Rentals, give us a call. We just may surprise you & create the floor you want. DANCE FLOOR KINGS offers White/Black Dance Floors, LED Dance Floors, Wooden Dance Floors, Holographic, Seamless Photo Marley Dance Floors, Custom Colors and Shapes. Here at Dance Floor Kings, part of Tower Productions in New York, we love dance floors! Setting up portable dance floors and taking them down for a few decades, we certainly learned a lot. Our experience and creativity has upped our game over the years, and brought you some of the most amazing dance floor rentals for events of all kinds and all sizes. As always, we will collaborate with members of your team for a stress free production. Dance Floor Kings also supplies the best in LED lighting, conventional uplighting, dance floor lighting, pin spotting and stage lighting. Whether it is a wedding, fashion show, gala, or party, our staff will work with you to develop a theme and set the mood for your event. We'd love to help you with your next event.